Varian Arabians - The Varian Arabians Blog - How Do You Do? Sometimes you meet the nicest people. Last year when I went to the Buck Brannaman clinic in Dayton, I met the Phinneys, Robert and Janet. They host Buck's clinic each year in Dayton and are fine clinicians themselves. They are a very quiet couple, good looking, and rode a pair of very nice horses. I ran into them again at the Cowboy Dressage Clinic last month, they'd stopped by just to watch the morning session and visit for a while. The more I chatted with them, the more I liked them. We talked about introducing Arizona to their cattle, so on a fine Wednesday, David and I loaded up Roy and Arizona and drove to Dayton. From town we followed their very detailed directions up about ten miles of paved road, winding through tall rolling hills of wheat bending to the breeze, deer appearing like apparitions as they stood up to watch us pass. Then about ten more miles of gravel road, bringing us high into the vast views of Washington's undulating landscape. The last ten miles or so was on a narrow dirt road, the hillsides turning to forest. Janet waved to us with a bright smile as we pulled in and told us where to park our rig. Arizona wondered what this place was. It smelled different. There were tall trees and shrub bushes and a few horses out there in a big area under tall trees. 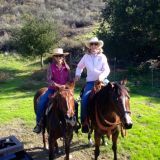 We saddled up and rode out into their Shangri-la, tall grasses brushing the horses' bellies, blue skies over our heads. We maneuvered a little ditch or two, and then went to check fences. From their property we looked out over what must be a hundred miles or more. Arizona reached a time or two at the shoulder high grasses, and watched the new horses. He was a little tight, but was responsive. We rode through a couple of gates, down and up a few little canyons, stepping over some downfall. I asked him to follow Robert down a slope to peer into a canyon at the fence line. David and Janet stayed high, near the gate we would be going through. It was only a little way, and it was a push on Arizona's comfort zone, but heck, you have to get them a little out there now and then, and he could still see Roy. As we turned to go back up the hill, he tightened up a little more, and then went up. It might not have seemed like much if we weren't already on an uphill slope, but this was a surprise to me. I leaned forward and released all pressure on the reins and clucked him forward as quick as I could. He came down, shook his head and walked on up the hill. About a minute or two later, I hear Robert's voice behind me. "Is that type of behavior common with this colt?" I loved that his comment was quiet, cool, not anything like the "what the heck was that about?" that one might expect to hear, (and actually was what was whispering in my own head). "No, it isn't. He's very quiet minded. He only went up a little bit, once before, at the V6 ranch when the dogs fired up the cattle, making them all jump and snort." Arizona went right back to being quiet after that, as we crossed into the new pasture where the cattle were grazing. I stayed close to Roy as we approached. The fat black cows with their calves were scattered about, some resting in the shade, some of the babies nursing. Little by little we stepped in closer. I watched Arizona's ears and listened to the wheels ticking in his brain. When the wheels clicked real fast I asked him to stop. We'd just stand and look at them, when the wheels slowed down, I asked him for a few steps more. The cattle were perfect, the Phinneys, no doubt, have them very well trained. 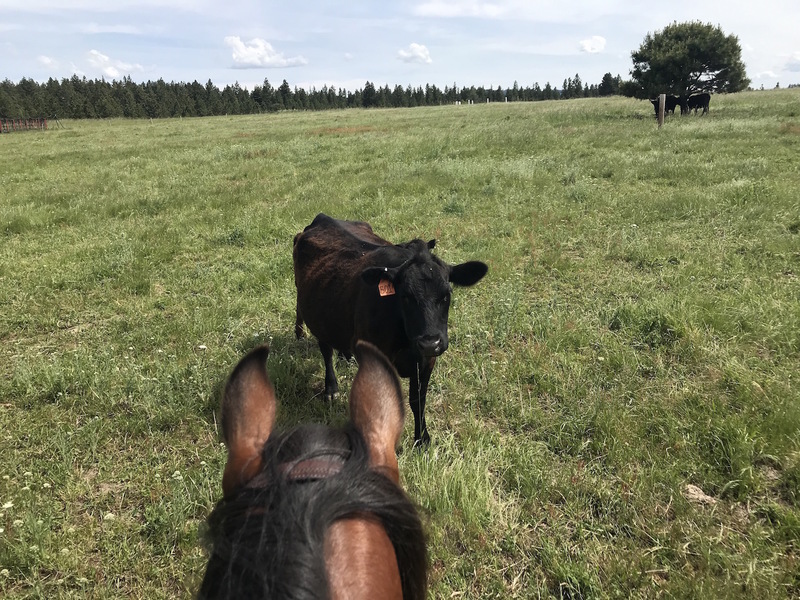 At one point, Robert talked about controlling the cattle, looking at their eye or their hip to make them move, and how a horse can influence the cow to step away by sidepassing toward the cow instead of going at her straight on. Robert and Janet were very patient, (so was David, but he's my husband) as Arizona and I little by little got closer and closer. In about a half hour he'd become pretty brave, pretty relaxed, pushing the cattle away from us, going back and pushing another one. Easy as pie. "Lisa, turn around, there's a calf following you." Robert's calm voice coached me from the side. I thought they were all just visiting, but he was watching. I was so focused on what Arizona was looking at, I wouldn't have seen this calf in his blind spot. Sure enough, there was a curious little guy following behind us. We turned around and I asked Arizona to step toward the calf. He did, and the calf moved away. Since the whole herd was moving off, I figured that was just a perfect introduction for Arizona. We rode back to the trailers. Back home, I wondered more about that little pop up in front, what caused it and what to do about it. I knew at the time, before we headed out, that it would be good to do a little ground work with him, but you know how it is when you're with someone new, I was a little bit timid, and he's been so easy. He's been outside a number of times, but has always been able to see his footing, here he could not see the ground through all that grass, and there were gullies and branches hidden in there, and I hate to admit it, but I probably had too much contact on the reins. I think he was overwhelmed, and being a youngster, he just boiled over at that point. The great thing is that he just did that one pop and then came right back to me. I don't like the idea of putting a gadget on a horse to fix a problem, because it doesn't really fix the problem, so I decided to step back and make sure the next few rides will be easy for him to deal with, unless we run into some moose or something unexpected, and I need to be sure to let him out on more of a loose rein. On a colt, they need support, but they need to be loose at the same time. It can be a fine line. Then I talked to Robert, since he has much more knowledge than I do about these things. He gave me some very good suggestions for doing ground work and under saddle work to help him stay connected and to help me control his feet. He reminded me of something Jack Brainard says, "If you can control their feet, you control their minds." He also suggested that I could have done some ground work before I got on. My eyes pinched shut when I read that, because I knew I should have done that… and I didn't. Here is a link to the Phinney's program. They are delightful folks. So, new friends, spectacular country, adventure and learning on a fine young colt, what could be better than that?